Few policies generate as much disagreement among economists as the minimum wage. In 2014 for example, two petitions relating to the US federal minimum wage were published online: one proposing an increase in the minimum wage, which was signed by around 600 economists, and another opposing any increase, which was signed by approximately 500 economists. Supporters of the minimum wage claim that it shores up the wages of the lowest paid workers, whilst having little distortionary impact on the labour market. Detractors retort that it is a poorly targeted anti-poverty measure, which exerts sizeable distortionary effects on employers hiring, pay and investment decisions. So what are the effects of increasing minimum wages? Any Econ 101 student can tell you the answer: The higher wage reduces the quantity of labor demanded, and hence leads to unemployment. In the same article, Krugman went on to note that “this theoretical prediction has, however, been hard to confirm with actual data”. And indeed, many economists’ reading of the literature now seems to be that any disemployment effects from the minimum wage are negligible. For example, in 2009, Doucouliagos and Stanley conducted a meta-analysis of over 60 different studies, and found that the most precisely estimated elasticities of the minimum wage clustered around zero. In a 2013 poll of the IGM Economic Experts panel, very few of the 34 economists who responded disagreed with the statement, "the distortionary costs of raising the federal minimum wage to $9 per hour and indexing it to inflation are sufficiently small compared with the benefits to low-skilled workers who can find employment that this would be a desirable policy." It should be noted, of course, that other economists, such as Neumark and Wascher, as well as Meer and West, have mustered considerable evidence to the contrary. There could be several reasons why many (though by no means all) studies have unearthed relatively small disemployment effects from the minimum wage. First, most markets for low-skilled labour are monopsonistic, meaning that prior to minimum wage increases workers were actually getting paid less than the competitive wage. Second, employers respond to an increase in the minimum wage by: cutting hours, trimming fringe benefits, reducing the wages of higher-paid employees, raising prices, lowering employee turnover, encouraging employees to work harder, or simply tolerating lower profits. Third, the lowest-skilled workers who are put out of work by the minimum wage subsequently sort into jurisdictions with lower minimum wages. Under competitive labor markets, a higher minimum wage will reduce the demand for low-skilled labor. The most reasonable explanation of our result is therefore that workers preferentially move to locations where the demand for their labor is highest. Since cross-country emigration is more difficult than migration between states or cities, increases in the federal minimum wage will have a stronger negative effect on low-skilled employment rates than we might expect from experiments with local minimum wages. In a previous post, I showed that EU citizens are much more sanguine about richer non-EU countries joining the EU (e.g., Switzerland) than they are about poorer non-EU countries joining (e.g., Macedonia). One possible explanation is that EU workers believe, correctly or incorrectly, that immigrants from poorer non-EU countries would be more likely to compete with them in the labour market. If this explanation were true, one would expect citizens of richer EU countries to be less sanguine about free movement generally. Which of the following do you think is the most positive result of the EU: peace among the member states; the free movement of people, goods and services; the Euro; student exchange programmes; the common agricultural policy; the economic power of the EU; the political and diplomatic influence of the EU; the level of social welfare; other; none? 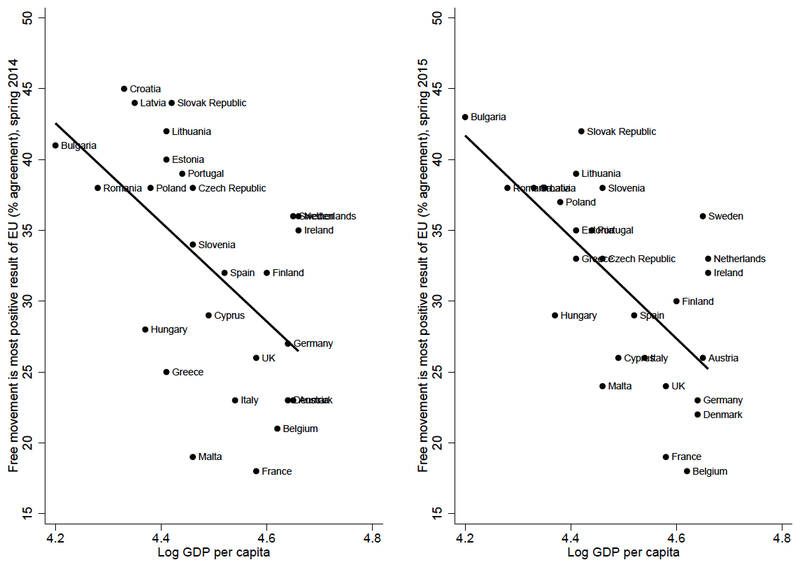 In both cases, the correlation is moderate and negative: citizens of richer EU countries are less sanguine about free movement than their counterparts from poorer EU countries. The correlation for the left-hand chart is r = –.55 (p = 0.003), while the correlation for the right-hand chart is r = –.66 (p < 0.001). Luxembourg was excluded because it is an outlier on GDP per capita, meaning that its inclusion obscured the pattern on the charts. Nonetheless, the correlations with Luxembourg included are approximately identical: r = –.55 (p = 0.002) for the left-hand chart, and r = –.64 (p < 0.001) for the right-hand chart. 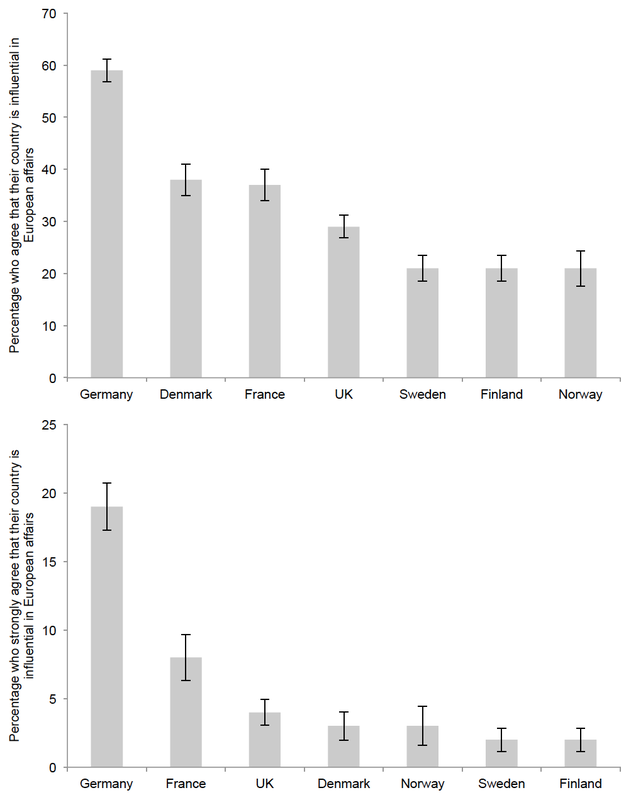 It is of course possible, however, that these results derive simple from the fact that citizens of richer EU countries consider some other result of the EU more positive than free movement (e.g., peace among the member states), and so by definition, fewer of them were available to say that free movement was the most positive. I just came across a YouGov poll from last week which asked respondents in seven European countries how far they agreed or disagreed with the statement, "My country is influential in European affairs". The upper chart below plots total agreement in each country, while the lower chart plots strong agreement. Perhaps unsurprisingly, the conventional wisdom that Germany holds particularly firm sway in Europe does not appear to be lost on the German people. Nearly 60% of Germans agree that their country is influential in European affairs, compared to less than less than 40% of French, and less than 30% of Britons. Similarly, almost 20% of Germans strongly agree their country is influential in European affairs, compared to less than 10% of French, and less than 5% of Britons.